1. A flour of a grain belonging to the genus Eragrostis, preferably Eragrostis tef, characterized in that the falling number of the grain at the moment of grinding is at least 250, preferably at least 300, more preferably at least 340, most preferably at least 380. So the claim seems to pertain to the Ethiopian grain Eragrostis tef (also known under its common name Teff), characterized by a certain parameter, i.e. the “falling number of the grain at the moment of grinding”. I have to say that claims of this type always make me quite curious, not to say suspicious. Two questions immediately spring to mind: (i) What is so special about this parameter, and (ii) how does one obtain a teff satisfying this parameter? In summary, Eragrostis offers an attractive source of (gluten-free) flour. However, it has been found that the preparation of a food product with traditional Teff flour (for instance Teff flour which is mixed with wheat flour for preparing injera) often causes problems. A known problem is the instability of the product, particularly of baked products. In other cases, the product has an unattractive taste and/or structure. The invention provides the insight that the above-mentioned problems surprisingly do not occur if Teff flour with a particular falling number is used. Different Teff varieties have been tested in different after-ripening stages and under different cultivation conditions (such as climate, soil type, fertilization) on test and cultivation fie lds. Samples hereof have been collected and analyzed for inter alia falling number and baking quality (with test breads prepared according to the formulation and method of Example 1). This shows that a falling number of at least 250 is needed to obtain a baking product with an acceptable quality, that is, a product that is awarded at least a grade 5 (on a scale of 1-10) by a test panel. A falling number of 300 results in a significantly improved product (assessment: 6), while a product of Teff flour with a falling number of 380-390 is, on average, awarded the grade 7. It can be gathered from Fig. 1 that, for a product which meets the ’market standard’ of 7.5, the use of Teff flour with a falling number of at least 400 is required. Wait a minute? A baking product “with acceptable quality” is supposed to have a falling number of at least 250? But isn’t this what the claim is supposed to cover? So does the claim cover all baking products made of Teff having an acceptable quality? It indeed seems so. Now, the patent further discloses (in ) that Teff has been cultivated for human consumption in mainly Ethiopia and Eritrea for more than 5000 years, and that it is traditionally used for preparing injera, a spongelike, gray pancake. This leaves only two possibilities: Either these people from Ethiopia and Eritrea never managed to produce a baking product (such as a pancake) with acceptable quality for the last 5000 years. Or there is perhaps something wrong with this patent claim. The traditional Teff flour, which is obtained by grinding the grain directly after the harvest, still causes problems with the processing thereof in baked products, as elaborated upon in the introduction. The invention now demonstrates that the reason for this is that, directly after harvesting, Teff grain of known Teff varieties has too low a falling number (that is, lower than 250) to be processed into an attractive product. It is generally known that grain goes through an after-ripening process after harvesting, in which the falling number of the grain increases. Preferably, a flour according to the invention is obtained by storing the harvested grain kernel and/or having it after-ripen for some time and only grinding the grain after the falling number has reached a value of at least 250. So the trick is not to use the teff directly after harvesting, but to store it for a while before grinding. And it seems that it was even “generally known” that by such storing (and “after ripening”) the falling number increases. Hmm. The invention provides flour of Eragrostis spp. grain, with the grain having been ground at least 4, preferably at least 5, and more preferably at least 8 weeks after harvesting. Such a period is usually sufficient to obtain grain which has after-ripened sufficiently and has a falling number which meets the above-mentioned conditions. 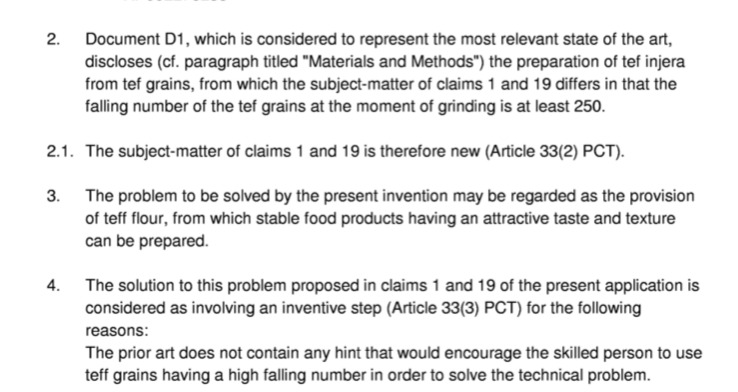 Thus, the conclusion appears pretty compelling that this patent protected any kind of teff, when stored at least 4 and preferably at least 8 weeks after harvesting, before being ground. And people never thought about storing teff for a few weeks or longer before using it? Which brings me to my real question: How could such a patent claim ever be granted? All quite understandable, at least if one limits the examination to a reading of the claim and the paragraph stating which problem the claimed invention is to solve. Yet, somehow this grant leaves a certain feeling of discomfort.